When I send Artemas or Tychicus to you, do your best to come to me at Nicopolis, for I have decided to spend the winter there. Do your best to speed Zenas the lawyer and Apollos on their way; see that they lack nothing. And let our people learn to devote themselves to good works, so as to help cases of urgent need, and not be unfruitful. How we need these reminders, to be submissive to the authorities God has appointed over us, starting with our own husband, and keep an obedient heart is pretty easy to forget. And this is specially difficult when the wife seems to be the one studying and reading all the books, and even being more concerned for the spiritual life of the family. If this is your case, sister, I want to encourage you to get rid of a mind-set that wants you to rise above your husband. He is God’s authority appointed in your home. Always pray for him, honor him, give him your advice, share your thoughts but at the end, bless his decision and hold his hand tight. Another word on submission and obedience is that we must be extremely careful not to give any kind advice to any of our friends against the authority God has placed over them. If your friend comes and asks you some advice, make sure that she is not only trying to find in you an ally against her husband’s decisions. This is a very delicate matter. We don’t want to sow disagreement between our friend and the authorities God has placed over her. The same principle applies if a young woman asks you some kind of an advice only to find more support to rebel against her parents. The odds are that her parents know a side of the story that you don’t. Next we have some characteristics that should govern all our relationships. Attitudes through which we’ll show all others, Christians and non-Christians alike, the Grace of God in our lives. * Be ready for every good work. * Speak evil of no one. * Show perfectly courtesy toward all people. The easiest way to live a life that is always giving grace, is remembering our own condition. Not forgetting how our former lives without Christ looked like will keep us humble, and always with a desire to give and serve more and more. you once were fool like that. you once lived loving anarchism. you once were one of them. don’t forget how much you loved your own sins. remember how you used to spend your days, your nights. you once hated the Light, Jesus. Don’t forget how grace appeared to you in Jesus. when you were in the most desolate pit. All this “remembering” is so that we may keep ourselves humble, grateful, and “so that those who have believed in God may be careful to devote themselves to good works.” It is interesting to note the words Paul chooses, “be careful to devote themselves…” If we are not careful, most likely we will soon find ourselves caught up in foolish controversies, genealogies, dissensions, and quarrels about all kind of Theological issues, while loving to stir up division and hating our neighbor in need by neglecting him. Sin of omission is real and it is very subtle, beware of its presence; it crawls in the heart and feeds on pride and arrogance. Again on verse 14 Paul says it again, “let our people learn to devote themselves to good works, so as to help cases of urgent need, and not be unfruitful.” If it is mentioned twice, it must be urgent. Let us not forget that this is the way we live grace, devoting ourselves to good works, loving the unlovable, and reaching to the one in need. This is not easy, at least it is not for me. The excuses are always there, but light has shown in the darkest corner of my heart and now those excuses, have been exposed by God’s Word; I must repent and reach with grace towards those around me, in a more significant way. Thank God, for His Word, and for the wonderful gifts He has given us: Memories to remember His Word, hearts in which to treasaure it and daily lives to practice it. 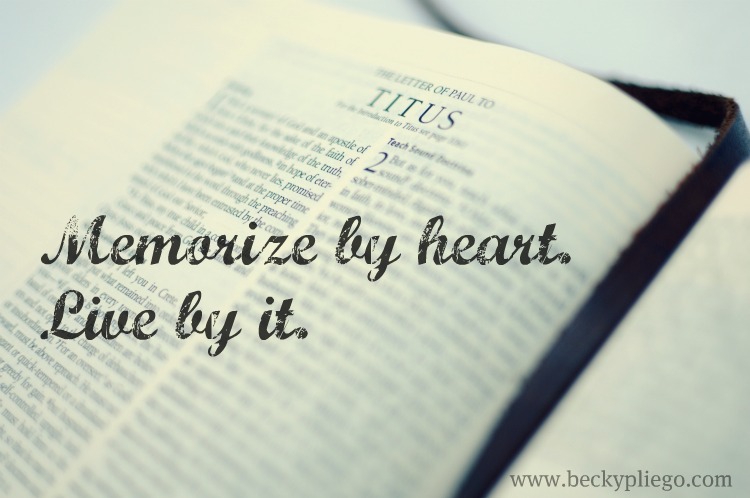 This entry was posted in Epistles, Memorization, Titus by Becky Pliego. Bookmark the permalink.